A flattering semi-fitted coat. Feather and fan panels with increasing width create flared sleeves and skirt. Knitted in an alpaca blend aran weight yarn (‘Artesano Aran’), the coat is designed to be super-warm, with a slouchy hood for extra comfort. Chart-reading skills are essential for this project as the stitch patterns for the cables and feather and fan panels are provided in chart form (ie – they are not written out). The pattern is written for 14 sizes (32-58 inch chests). You will require 13(14:15:15:16:17:17:18:18:19:20:20:21:22) 100g skiens of aran weight yarn with 132 metres/144 yards per skein. Tension/gauge is 17 stitches and 21 rows per 10cm/4″ in stocking stitch/stockinette. Suggested needle size is 5mm/US 8. Skills required include twisted stitch cables (ie Bavarian cables), icord, picking up stitches, basic lace, purl decreases, provisional cast-on (underarm), kitchener stitch, and knitting in the round (for the sleeves). The coat is a seamless top-down knit with integral set-in sleeves. 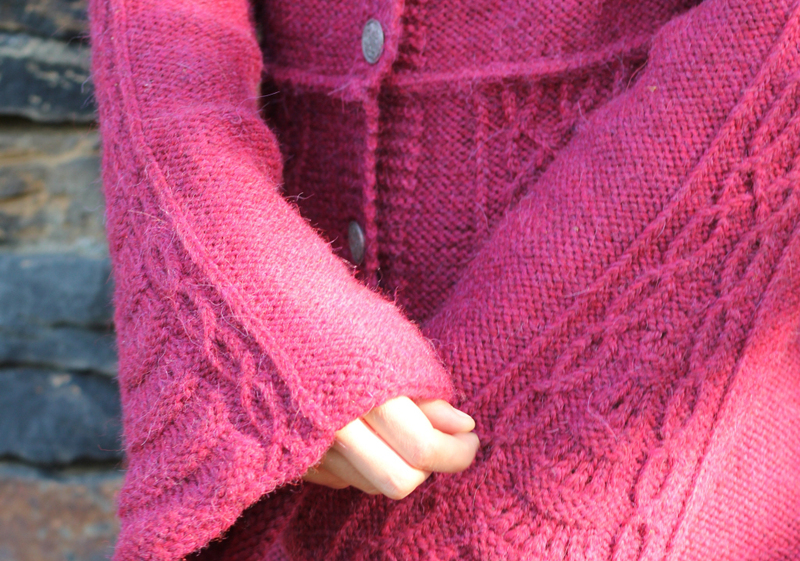 The Anwen pattern is also available in ‘A Time To Knit’ (see ‘Books).